Roy Pitz Barrel House in Spring Garden opened in June and specializes in original brews. What the foudre is going on with Spring Garden Street? Beer is going on. And suddenly lots of it. That much is obvious if you've driven along the eastern end of Spring Garden in the last few weeks. If so, you've probably seen the huge silo-shaped fermenter tanks that recently landed like beer missiles on the sidewalk in front of the old Destination Maternity as it transforms into Yards Brewing Co.'s gigantic new $19 million brewery, beer garden, and event space. Yards, which hopes to open there sometime before the end of this year, is the biggest sign of brews to come. But it's hardly the only one. Another newcomer, Love City Brewery, is set to open a production facility in November and a tasting room early next year at 1016 Buttonwood, just a block south of Spring Garden. Barely a half-block from there, at 990 Spring Garden, the Roy-Pitz Barrel House can already give every beer geek an up-close and personal view of exactly what a foudre is. These are the giant 310-gallon oak barrels you'll see at the back of the surprisingly vast and slick industrial space the Chambersburg brewery opened two months ago in a former warehouse, where golden ales can age patiently for up to two years and interact with the oak and special microbes that can turn those brews sour, or funky with wild brettanomyces yeast, or both, as brewer Chris Collier takes to blending, fruiting, and tweaking umpteen variations. The mahogany-colored Nice Dreams series I tasted brought a full-on power pucker. The Captured Culpbrett took the juicy citrus notes of an IPA to funky town. The Cherry Hound, made from a base beer tarted in the quicker "kettle sour" method, reminded me of a Cherry Coke crossed with Cynar amaro. These are traits I've grown to love in beers when they're properly crafted and are especially good companions to food, such as the scoop of cuminy hummus, turned an earthy shade of orange with soft sweetness of roasted carrots that chef Dave Champagne mixes in and serves with housemade flatbread. Or a big platter of charcuterie served with artisan cheeses and house pickles. The craft of barrel-aging and blending beers – or "liquid art" as the Roy-Pitz ownership team of Jesse Rotz, Ryan Richards, Mike Treon and Collier like to call it – has become a rising trend in this otherwise IPA-dominated region, with such stars as Tired Hands, Forest & Main, Free Will, Weyerbacher, and newer La Cabra leading the way. Roy-Pitz still brews the beers at its Chambersburg headquarters and trucks them down the Schuylkill to age them in its Spring Garden space, but it's notable that it has chosen Philadelphia's sophisticated market as the place to grow its sour beer program. "Chambersburg likes less-risky beers," says Collier. The arrival of Roy-Pitz, which also brings an excellent array of other "clean" German styles to the 16 taps behind the cold-rolled steel of its 23-foot-long bar, adds another welcome player to a local scene that's growing with unprecedented energy. It's part of the larger boom of more than half-a-dozen brewers in the last year who suddenly planted roots within the city limits from Fishtown to Northern Liberties, Brewerytown, and South Philly. But this spot is especially intriguing as a key anchor to Spring Garden's rising beer district. With its striking space and a menu that goes a little beyond the usual brewpub clichés, the Barrel House has the potential to become an accessible focal point for a dynamic neighborhood that's finally taking shape with some momentum here — the "here" at various moments labeled as the Loft District, Eraserhood, Spring Arts and future home of the Reading Viaduct Park — not to mention a perfect spot for a nibble and drink before a concert at neighboring Union Transfer. 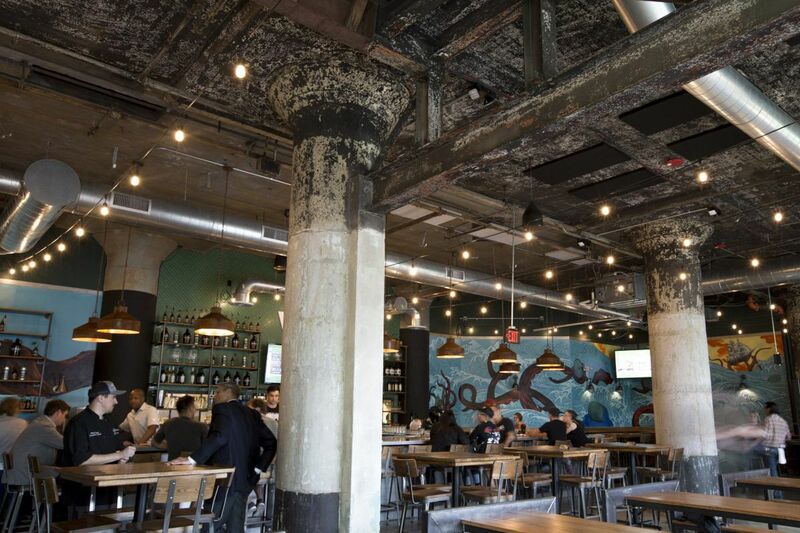 This long and airy space is clearly built for a crowd, its industrial concrete bones peeled back to the pillars and old delivery docks fronting Spring Garden, now filled with broad windows that cast light on pine-topped community tables, a wall of smaller barrels, and a funky sea mural of a kraken attacking a ship of barrels, painted by Will Hemsley, the artist (and Rotz's cousin) responsible for Roy-Pitz's beautiful label art. The menu from Champagne, who formerly worked at Rembrandt's, does a solid job of bridging the desire for drink snacks with a genuine meal, with modest nods to seasonality and scratch cooking. A shrimp ceviche comes in an almost gazpacholike brew of brothy pico de gallo and avocados, alongside freshly crisped tostones. I loved the fried green tomato twist on the usual Caprese, layering the cool mozzarella between warm crisp layers of tempura-fried tart tomatoes, plus the summer touch of fresh apricots, basil, and pickled rounds of watermelon radish. There are plenty of overtures to the vegetable-minded crowd, with a vegan chickpea sandwich, and a big head of romaine charred over the grill beneath roasted fennel, grapefruit, pickles, and an Asian-flavored sesame dressing that's an interesting departure from the typical Caesar. The carrot hummus is a hit. The house-cut French fries get their own line item on the appetizer list, and rightly so. They're made from spuds grown by a Chambersburg pal, and they're among the best I've had in town of late. No surprise Roy-Pitz goes through 250 pounds on a Saturday night. But the kitchen excels at meaty options, too. The house burger, a half-pound blend of brisket and short rib, was a delicious mess of porter-caramelized onions, sweet pickle chips, "liquid art sauce" (a mustardy BBQ), and juicy meat on a bun. The chicken egg roll completely defied my low expectations, and was less about the usually doughy crust and more about a filling of tender pulled chicken blended with pepper jack cheese, pickled cabbage, and zippy beer mustard. A couple of larger plates on the growing entree list were good but could have been great with a few tweaks. The tender pork chop came with full-flavored bacon fat fingerling potatoes, spiced carrots, and cherry-bacon chutney, but the underseasoned meat itself needed more of that sour beer sauce to keep it moist. The smoked brisket over mac and cheese had good flavors but also could have been more juicy. Only a special of chicken and chorizo tacos was a complete disappointment, which is not advisable considering El Purepecha is knocking out serious taqueria standards (try the sopes) on Buttonwood Street directly behind Roy-Pitz's building. Ultimately, though one can eat well enough here, it's the beers that will distinguish Roy Pitz in Philly's busy beer landscape. And though the tasty sour beers may be this location's future focus, the legacy of German and British styles that established this brewery to begin with are worthy of attention, too, from the quaffable Best Blonde golden lager to the smoky Ludwig's Revenge rauschbier (downright creamy on nitro) to a Capt. Bill's Barleywine aged in bourbon barrels that was so well balanced it was the beer equivalent of smoking a fine cigar. Pitz has also embraced the fruit beer trend with a very summery and refreshing watermelon lager, its subtle natural flavor steeped from 160 gallons of hand-cut fruit. But it was the kolsch, completely infused with brewer-picked Franklin County strawberries — vividly ripe but quenchingly not sweet — that stole my attention. Not only was it good in the glass, it was sublimely churned into an icy red sorbet that ended the meal beneath a dollop of stunningly rich whipped cream from Chambersburg's renowned Trickling Springs Creamery. Call it dessert on tap. I'll take a foudre of that to go.